One of my favorite things to do during the holiday season is looking at Christmas lights. I can literally sit on my couch and just gaze at my Christmas tree. As I noted in my last post, one of my fondest memories when I was little was hopping in the car with our PJ’s on and driving around neighborhoods to view the houses lit up with the holiday lights. 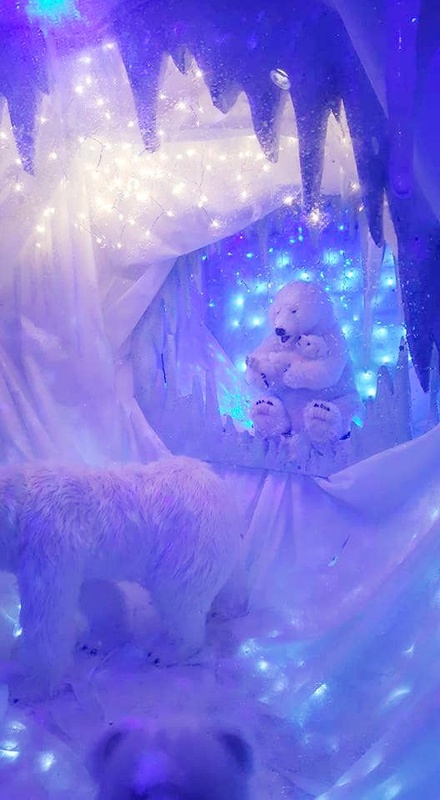 Also if you read my last post, you’d know that we visited Santa underground at Ruby Falls in Chattanooga Tennessee. I received tickets to facilitate a review. As always, my opinions are my own. If you are unfamiliar with the area, then I must tell you that Ruby Falls is apart of Lookout Mountain and at the very top of Lookout Mountain is Rock City. 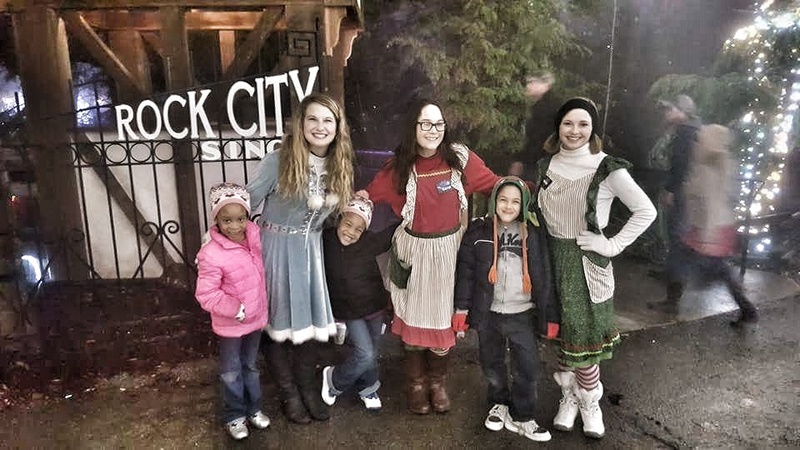 Each holiday season Rock City hosts the wonderful event; Enchanted Garden of Lights, a magical experience you’d have to experience for yourself to truly appreciate it. I must first tell you how foggy it was that night, we could barely see in front of us on drive up the mountain. You’d be amazed to know that there is a lot up there than Rock City. Besides people residing there; there is a college, bank, restaurants and of course, a Starbucks. When we walked up to the gate, we saw three workers there dressed for the occasion. We immediately knew we wanted a photo with them. They were equally as excited to take a photo with the kids as we were! Totally fun and great staff members. We took a couple of photos before heading down the walk to explore the beauty of the lights (but honestly it was so foggy that getting a good shot wasn’t the easiest task to achieve). We met Snowflake and headed into the Ice area. I can’t explain enough on how whimsical it is to be there. As I tried to compose a word to describe it, I realized that Rock City hit the nail on the head. Enchanting. 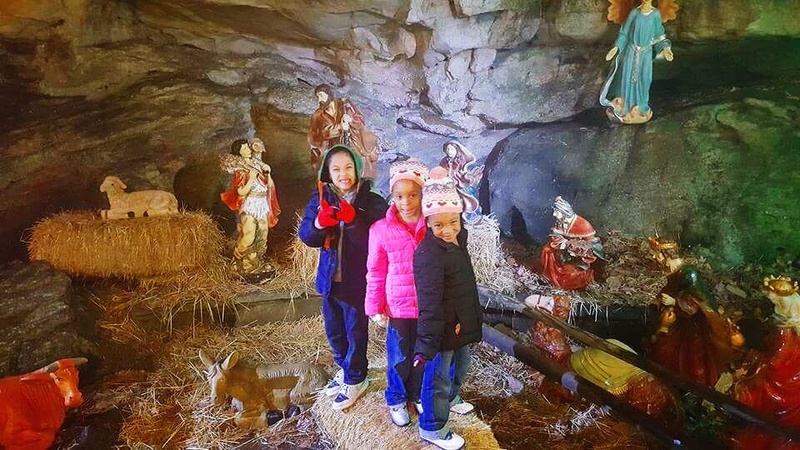 Traveling through Rock City you’ll see lights fitting snug to trees and some dangling in the wind, light displays of toys and scenes of holidays along with the sounds of Christmas tunes that even had my friend who can’t stand Christmas music singing. All the while there were various aromas that we tend to only acquire during the holiday season encase your nose. There were no Grinches there that night, even all the characters we met were super friendly and truly seemed excited to be apart of this yearly event. When we walked out of one section we realized we made it back to Snowflake and thought our experience had come to an end. Snowflake directed us to travel through the covered bridge to what had become my favorite part. The dancing trees. As we were walking up you could hear Christmas tunes getting louder. I requested the children to not make a peep as we traveled through the dancing trees, which usually means be as loud as you possibly can. 😉 To my surprise they actually stayed completely quiet and danced as we made our way through the whimsical trees. There is more to do there than just view the spectacular light display. You can visit Santa, decorate Gingerbread cookies ($3.50/cookie) and purchase a cup of hot chocolate. We totally would have decorated some cookies but didn’t bring our wallets in, so no cookies for us this trip. This is the best holiday light display that I have been to. I loved it so much and it is an absolute must every year from here on out. It’s an event that the whole family will love, as long as they are capable to maneuver the grounds of Rock City. It will take you to a place of when you were little and the excitement you had when you jumped in the car in your PJ’s to ride around town looking at all the Christmas lights. I had such a good time, as well as everyone in my party did. And the share something like this with children is even more gratifying. 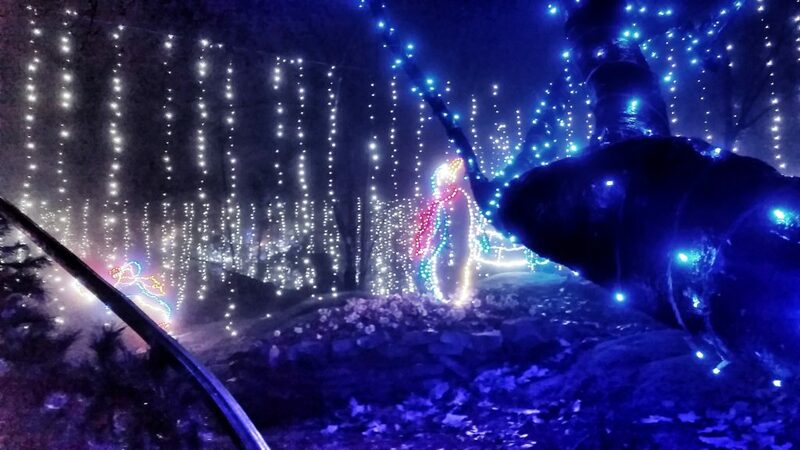 Enchanted Garden of Lights is going on until December 31st! Get your tickets HERE to make great memories with your loved ones!